Tuberculosis. Tuberculosis (TB, from Mycobacterium tuberculosis and/or Mycobacterium bovis) is a major cause of morbidity and mortality in HIV disease. It usually presents as reactivation of a pulmonary primary focus, with a risk of 7% to 10% per year for HIV-infected persons regardless of CD4 lymphocyte count, versus 10% per lifetime for HIV-negative persons. There can be involvement of the lungs, central nervous system (CNS), or other organs, with rhinosinusitis, diffuse or localized (scrofula) lymphadenopathy, skin and mucosal ulcers, chronic otitis, and laryngeal involvement. Fever, chills, night sweats, and weight loss may be the presenting symptoms of any form of tuberculosis. Hemoptysis may be a symptom of laryngeal, tracheobronchial, or pulmonary disease. The clinical presentation becomes more atypical as the immunosuppression worsens; pulmonary TB presenting with essentially normal chest X ray is not uncommon in CD4 counts of less than 50 cells/mm3. TB can also coexist with other OIs in the same host. For the reasons above, all HIV patients with any symptoms that could be associated with TB need to undergo clinical screening with skin testing, chest X rays, and appropriate samples submitted for acid-fast smears and cultures. A more detailed discussion of TB appears in Chapter 12. Mycobacterium Avium Complex and Atypical Mycobacteria. M. avium complex can be a cause of significant morbidity and mortality for AIDS patients, usually becoming a problem with CD4 counts of less than 50 cells/mm3. Other atypical mycobacteria (Mycobacterium kansasii, Mycobacterium fortuitum, Mycobacterium gordonae, and Mycobacterium hominis) sometimes can be isolated from clinical samples, but their role as pathogens and their management are controversial. Further discussion of atypical mycobacteria can be found in Chapter 12. Oroesophageal Candidiasis or Candidosis. Oroesophageal candidiasis or candidosis is a superficial infection of the oral, pharyngeal, and esophageal mucosa caused by the fungus Candida. It represents the most common fungal OI among HIV-infected individuals; about 90% of all patients will develop it during the course of the disease. 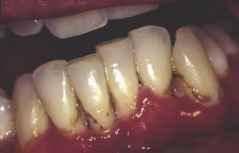 Normally present in the oral cavity in healthy persons, Candida can overgrow and through upregulation of genes or via infection with more virulent strains can cause infection. In 75% of cases, the oral infection is associated with concurrent involvement of the esophagus or the larynx and tracheobronchial tree, especially in deep immunosuppression. Typically seen in the pre-HIV era as a complication of antibiotic treatment, it has been one of the cardinal presentations of advanced HIV infection with CD4 counts of less than 200 cells/mm3, but can be seen during acute HIV infection or in the asymptomatic stage. Presence of oral candidiasis or oral hairy leukoplakia (OHL) predicts the development of AIDS in HIV-infected persons, independent of CD4 counts (12). Despite the reduction of incidence in the HAART era, it remains a significant cause of morbidity and malaise in persons with severe immunodeficiency. Other well-known coexisting predisposing factors are steroid use, antibiotics, diabetes, anemia, xerostomia, radiation therapy, use of dentures, and dehydration (13). Most of the cases are actually asymptomatic and the person is often unaware of the presence of the infection; with time, soreness, dysgeusia, hoarseness, aspiration with laryngeal involvement and burning, dysphagia to solids and liquids, and odynophagia develop when the esophagus is involved. The most commonly encountered species (in 77% or more) involved in this infection is Candida albicans, but frequently other species, including Candida tropicalis, Candida guilliermondii, Candida dubliniensis, Candida glabrata, Candida krusei, and Candida parapsilosis, are present, some of which might be inherently resistant to fluconazole. 4. Atypical; including exfoliative cheilitis and palatal papillary hyperplasia. FIGURE 3 Pseudomembranous form of oral candidiasis of the buccal mucosa. Source: Courtesy of the International AIDS Society-U.S.A. From Refs. 3, 4, 11.